These one-bowl Pumpkin Morning Glory Muffins are packed with walnuts, raisins, shredded coconut, crushed pineapple, and grated carrots. They make for a perfect and comforting fall breakfast treat! Funnily enough, the one thing you won’t see me getting excited about is… pumpkin spice lattes. I don’t drink coffee! Honestly, I’ve just never liked the taste of it (oh man, I’m going to get some haters for that comment, aren’t I?). But every so often, desperate times call for desperate measures, so the one time I’ve ever ordered a coffee in my entire life, it was indeed a pumpkin spice latte. Of course, I was in college and I had an Econ exam coming up that afternoon. In addition to staying up late the night before, I’d also woken up early to cram, so I was exhausted. For the sake of getting some caffeine in my system, I was hoping that pumpkin flavored coffee was something I could handle. And I guess it was tolerable? But I’ve never ordered a coffee since! So instead of fall-flavored coffee drinks, I celebrate the season with plenty of pumpkin baked goods. And this year, I wanted to make a morning glory muffin that also incorporated my love for pumpkin. I discovered morning glory muffins about a year ago and fell completely in love with them. Filled with all sorts of goodies (shredded carrots, raisins, apples, nuts, etc), they’re sort of an “everything but the kitchen sink” type of muffin, which is right up my alley. They are also similar to carrot cake, which is one of my absolute favorite desserts, so one of these for breakfast is totally a win in my book! In fact, the batter for these pumpkin morning glory muffins is just slightly adapted from the pumpkin carrot cake recipe that I posted last week. The main difference is that I replaced the sugar with honey, and cut down on the sweetness just a bit. 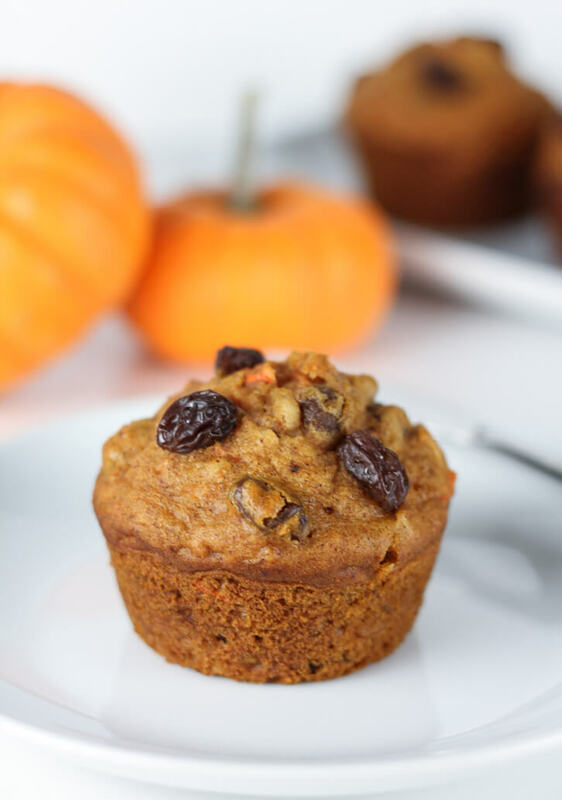 The result is these perfectly moist pumpkin morning glory muffins, with just the perfect balance of yummy add-ins. They smell just like fall and if you do drink coffee, I imagine that they would go very well with a pumpkin spice latte on a crisp fall morning! Try it out and let me know? Preheat oven to 375 degrees Fahrenheit and prepare a 12-cup muffin tin with muffin liners, or grease generously with cooking spray. Whisk together dry ingredients (flour, baking powder, baking soda, spices, and salt) in a large bowl. Add honey, pumpkin, oil, and vanilla, whisk until just combined. Add egg and egg whites, whisking to incorporate. Fold in carrots and pineapple with a wooden spoon or rubber spatula. Then, fold in coconut, raisins, and walnuts. Divide batter evenly among 12 muffin cups. Bake in preheated oven for 13 minutes, then lower heat to 350 degrees. Bake for an additional 5-8 minutes, or until a toothpick inserted into the center comes out clean. Let muffins cool in pans for about 5 minutes, then transfer to a wire rack to let cool completely.